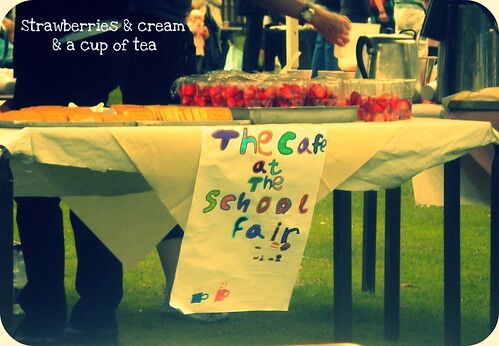 We chanced upon a couple of local school summer fêtes this weekend which is the type of thing that really cheers me up with visions of bunting strung up and homemade cakes on offer. The weather was cheery yellow sunbeams and we spent a while mooching around tombola and white elephant stalls, laughing at several dads attempt the coconut shy and 'splat-the-rat'. All very English with the local vicar walking around nodding hellos and eating a slice of fruit cake. Ambling around we were treated to the oom-pah-pah of a brass band at one school, followed by cream teas whilst watching chaotic children dancing around the May Pole at the other. The great thing about school fairs is that they always sell loads of books and toys, especially cheap. I came out with armfuls for literally a couple of pounds. Great for our book nook. 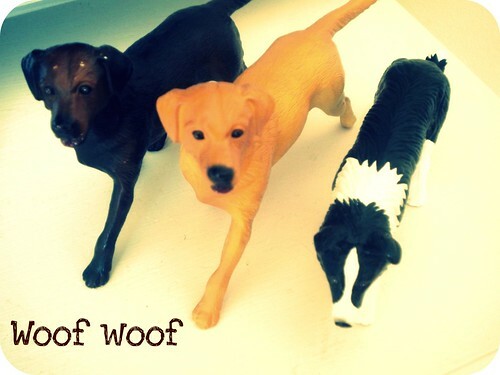 Doggies for learning about animals and imaginary play. Pink spangly skipping rope - yes I know I have a boy but so what! 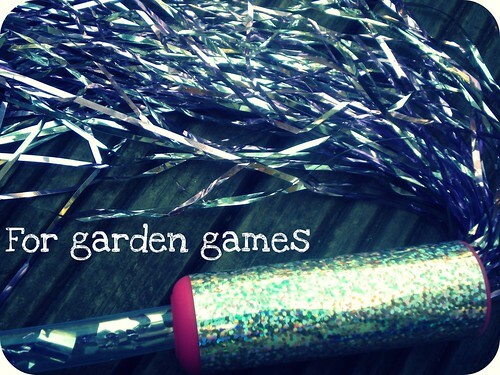 I thought it would be good for garden games like throwing bean bags over the line etc.. He actually loves the glitteriness of it! 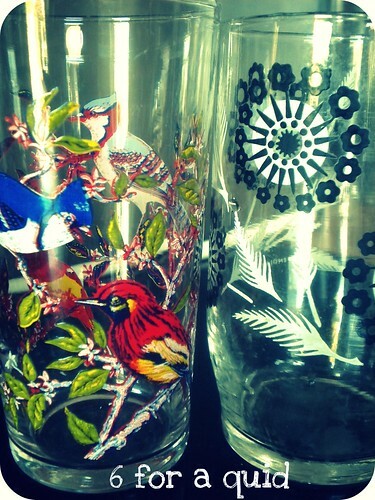 From the white elephant, more glasses for my collection. I adore the birdy ones, of course. 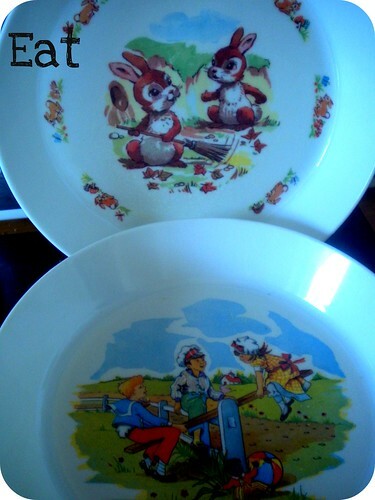 Vintage bowls with cute pictures for Little Bird's dinners. It was also an opportunity to view some of our possible future primary school options for Little Bird. Colourful displays, fun gardens, poems, singing and dancing, climbing frame and swings, future teachers and the other parents! Seems like a long time away but it's good information to have in our minds. 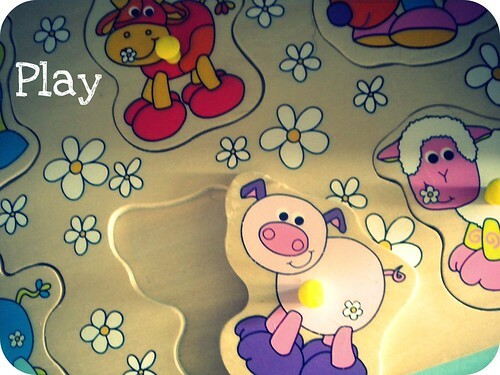 I'm joining in with Magpie Monday over at Me and My Shadow where you can see lots of other lovely thrifted treasures. I Love the glasses and the pretty bowls...Gorgeous! Sounds like a great way to size up the local schools! I adore your nursery bowls, they are gorgeous. Really lovely bowls. I have a school fair coming up, it always is great for toys and books. Love the captions on your photo's very clever! Yes, I just love fete season and have a few coming up soon. Like you say, loads of bargains and I do like a bargain (or one hundred lol!) 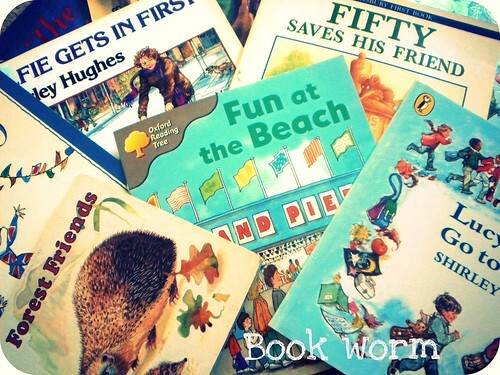 I love the kiddy plates in particular and love your term "book nook"